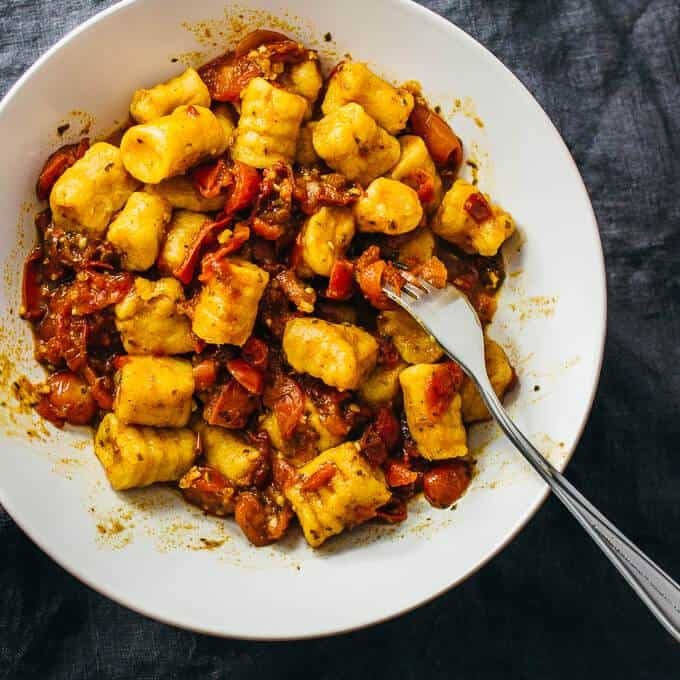 2-Ingredient Sweet Potato Gnocchi: This recipe is so easy it will blow your mind! Plus, your taste buds are going to love you! Only 15 minutes and you will be ready to enjoy this dish. 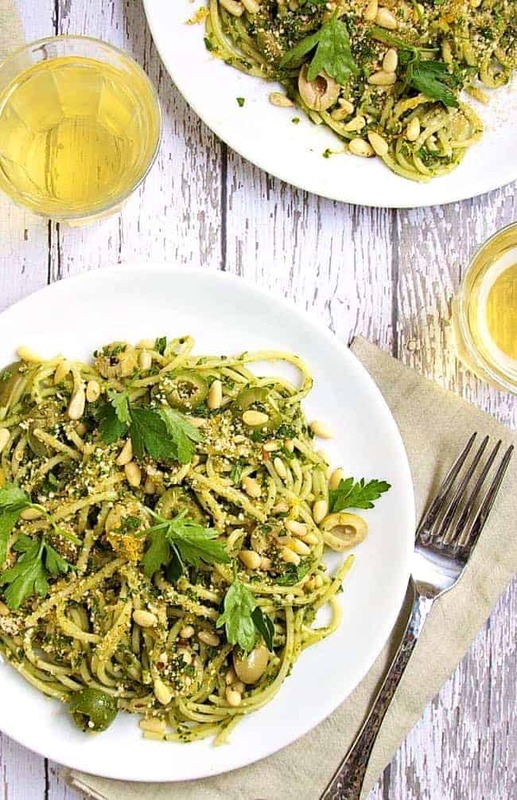 Zesty Spaghetti With Olives And Pine Nut Gremolata: Hearty dish with a perfect combination of spaghetti, crushed red pepper, zesty lemon, pine nuts, spices and seasonings and olives. 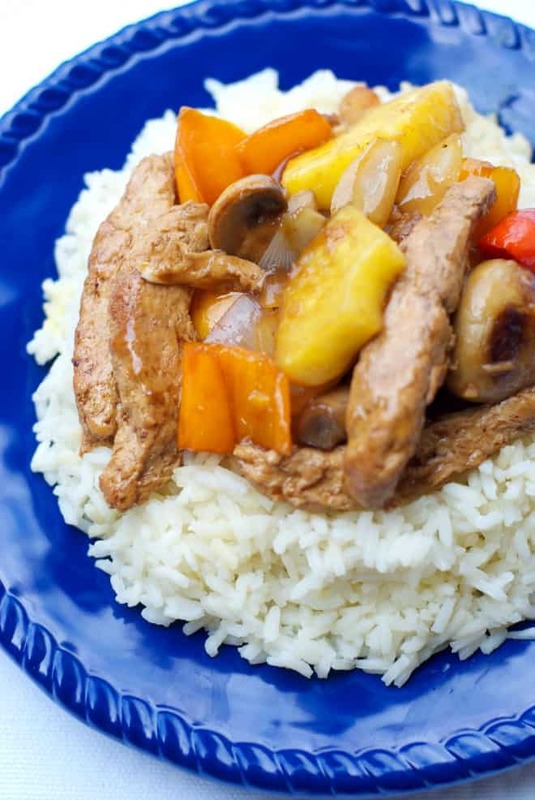 You can have this meal ready in around 30 minutes! 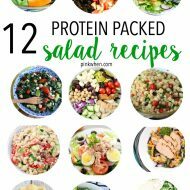 Simple Pasta Salad With Balsamic: Fantastic dish for those hot summer days when you are looking for a light meal that doesn’t drag you down. 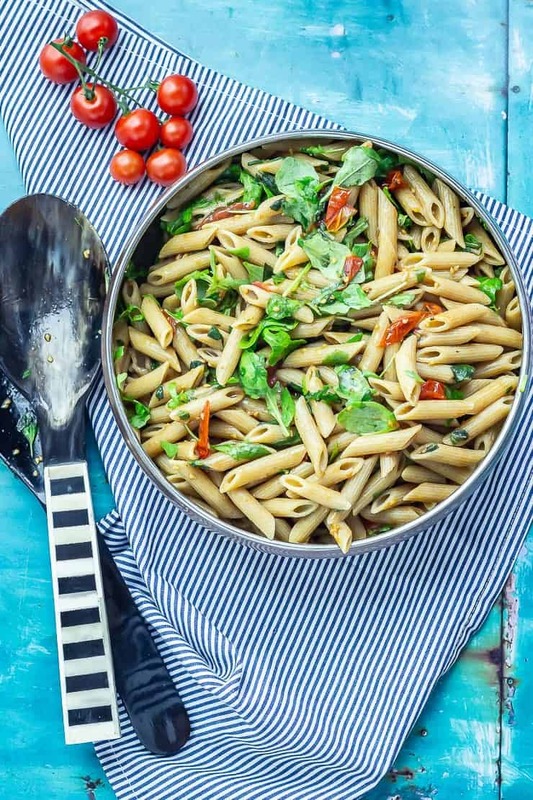 This pasta dish is exploding with amazing flavor! 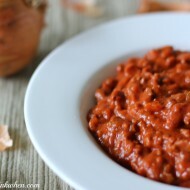 Easy Vegan Chili: Tasty and filling you are going to love this chili! It’s hearty flavors and great texture are perfect. Be warned that you may want to lick the bowl clean. 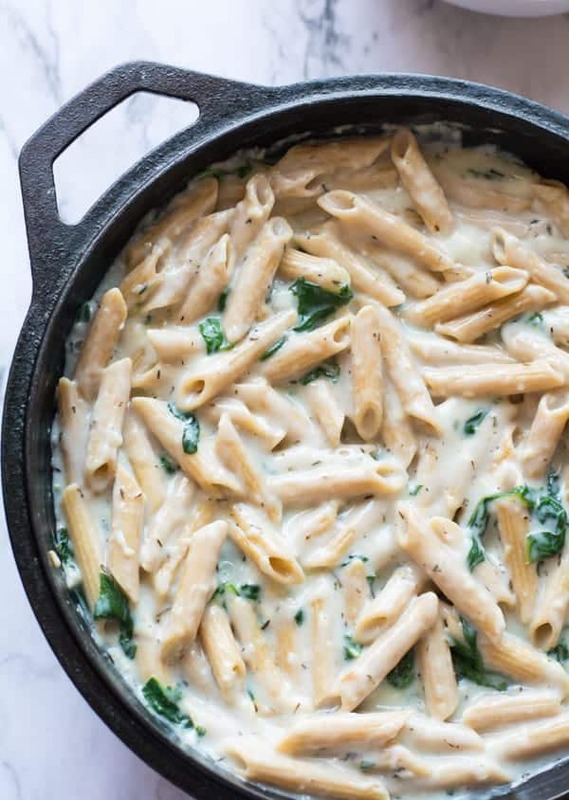 Vegan Spinach Pasta Recipe With Alfredo Sauce: One pot dish that is rich, creamy and simply delicious! The best part is that it only takes around 25 minutes to make. 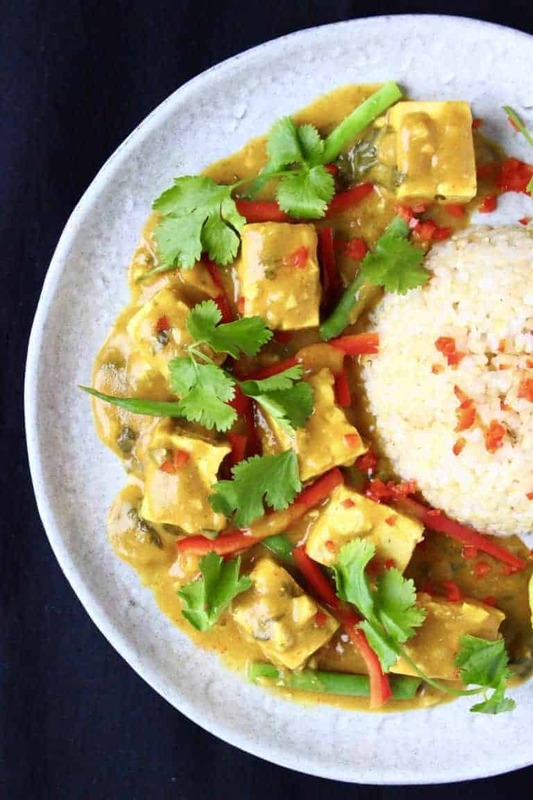 Peanut Tofu Satay Curry: Asian inspired cuisine in only 20 minutes! The creamy flavor of the peanut butter and the curry is divine! 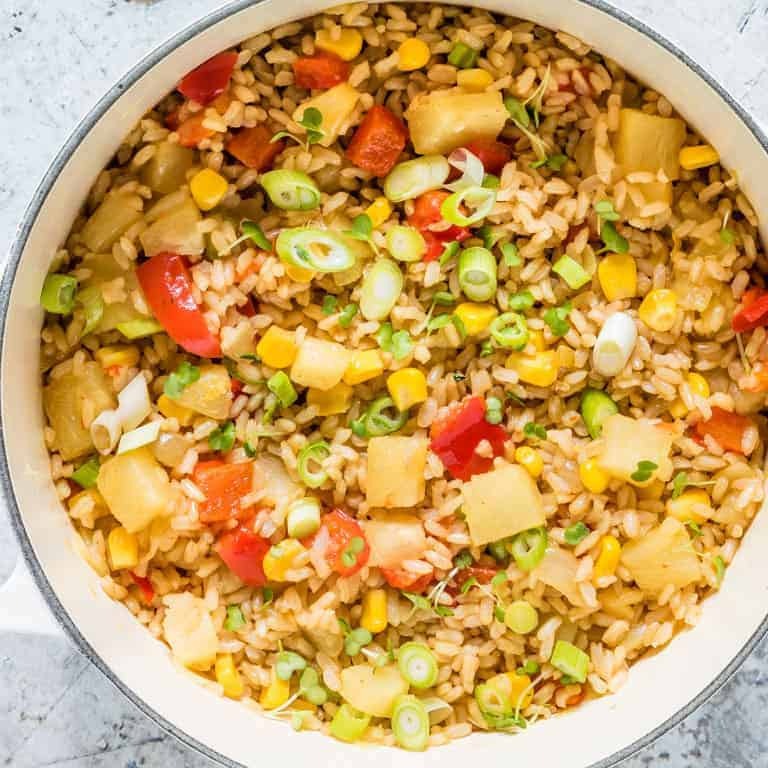 Pineapple Fried Rice: This dish is so good that you are going to want to add this to your weekly recipes! The sweet pineapple with the corn is an amazing combination. 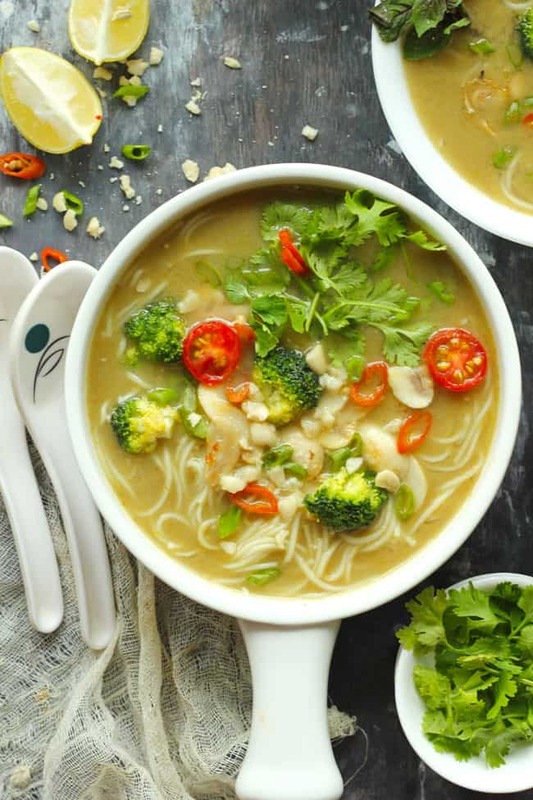 Vegan Thai Green Curry Soup: I love the bright colors of this tasty soup. It’s super easy to make and the flavor will keep you coming back for more. 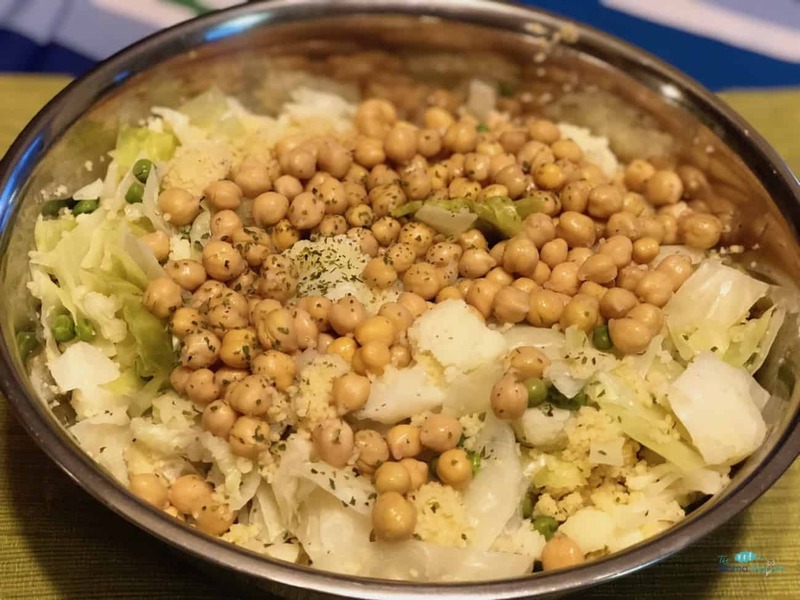 Couscous With Chickpeas And Cauliflower: With only 5 ingredients and 30 minutes you are going to love this simple meal. Give it a try, you won’t regret it! 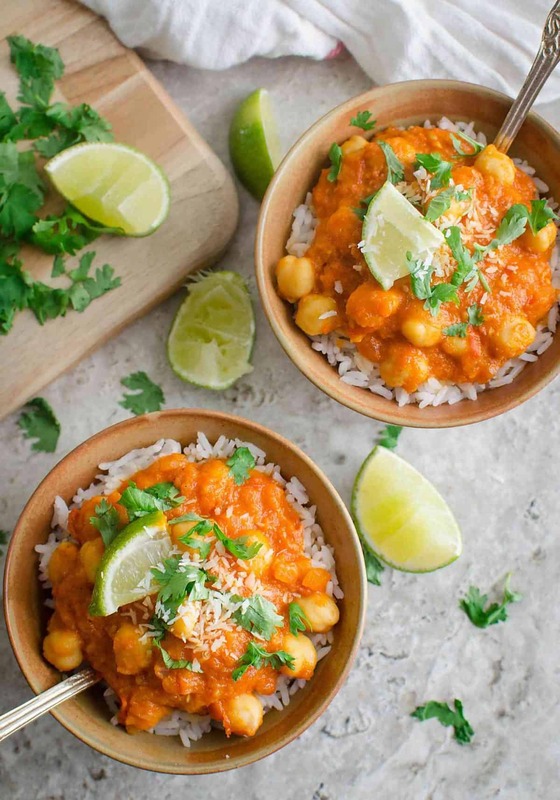 Easy Coconut Chickpea Curry: Garden fresh tomatoes, onions, chickpeas, coconut milk, vegetable stock, minced garlic, cilantro, zesty lime and seasonings go together to make a gorgeous and flavorful dish. 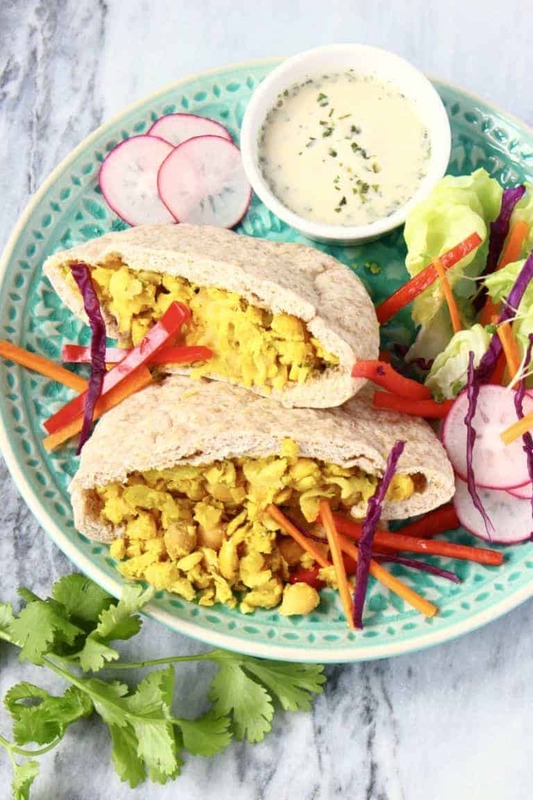 Vegan Wraps Using Naan Bread: Fresh ingredients and homemade avocado dressing make these vegan wraps heavenly! Perfect meal for a busy evening. 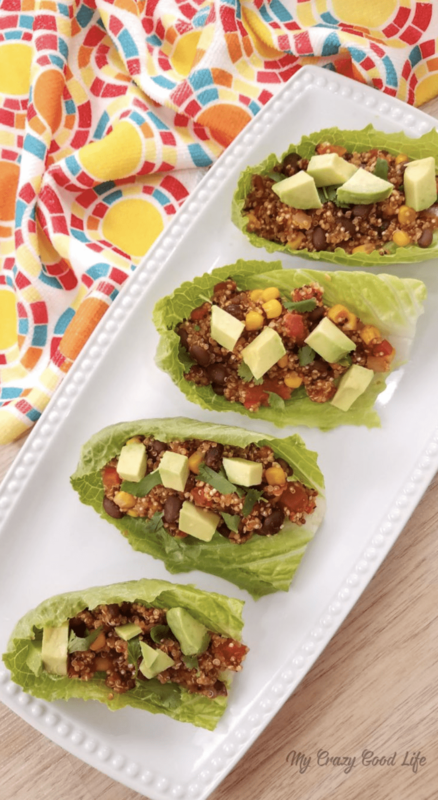 Quinoa Tacos: Hearty mexican inspired recipe that is sure to keep your stomach full and your taste buds in love! Easy and fast to make. 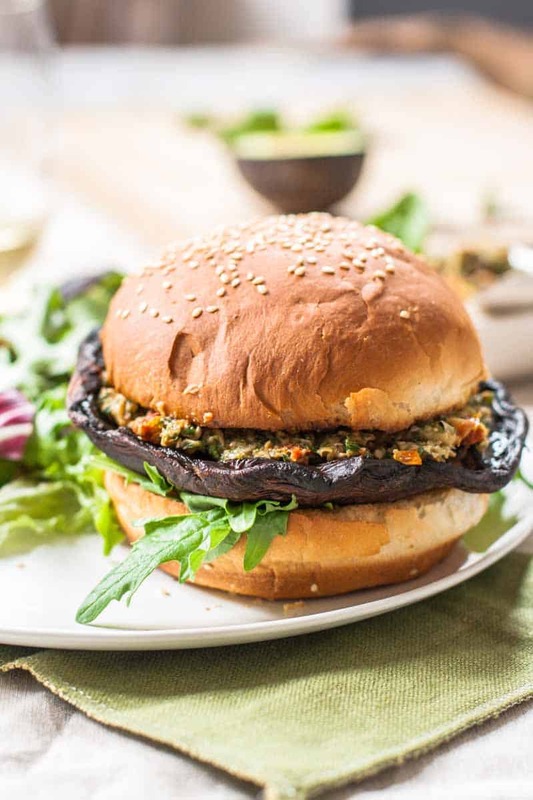 Portobello Burgers With Sun-Dried Tomato Pesto: These are mouthwatering amazing and are sure to be a hit! The sun dried pesto takes it to a whole new level of awesomeness. 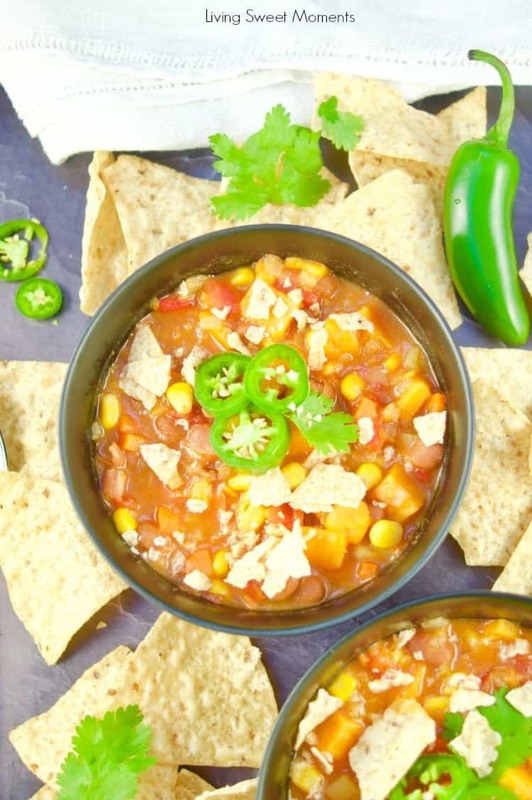 Quick Instant Pot Sweet Potato Chili: This chili recipe knocks it out of the park! 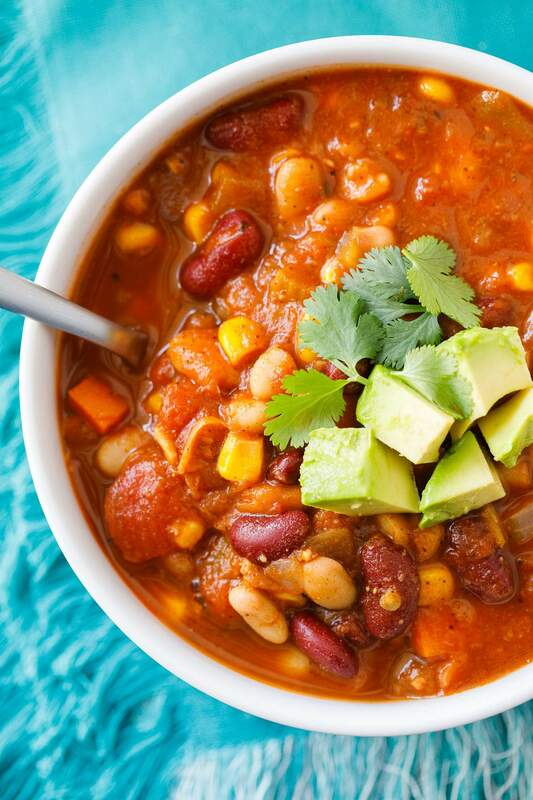 It’s so hearty and perfect for a cold day. 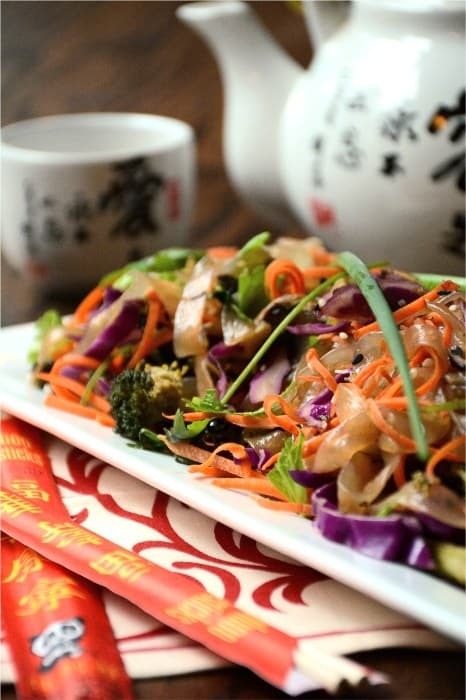 Paleo Pad Thai: Garden fresh broccoli, mushrooms, red cabbage, shredded carrots, miracle noodles, vinegar topped with a coconut based sauce. 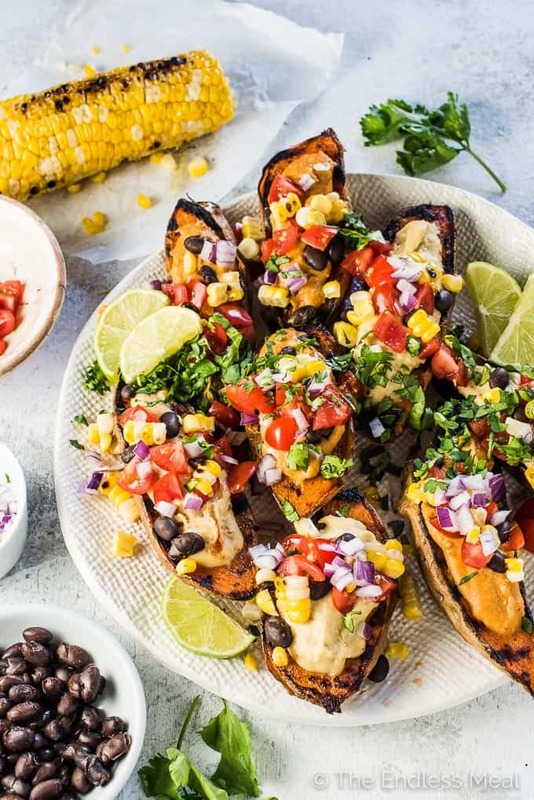 Grilled Southwest Stuffed Sweet Potatoes With BBQ Hummus: This meal is sure to be a crowd pleaser. It is so simple to make and the end results are fantastic! 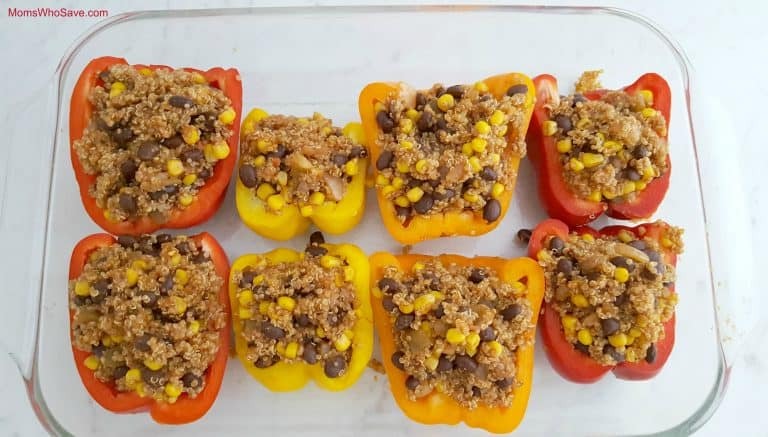 Mexican Stuffed Peppers With Quinoa & Black Beans: These stuffed peppers have the perfect amount of spice to liven up your next meal. Easy and tasty! 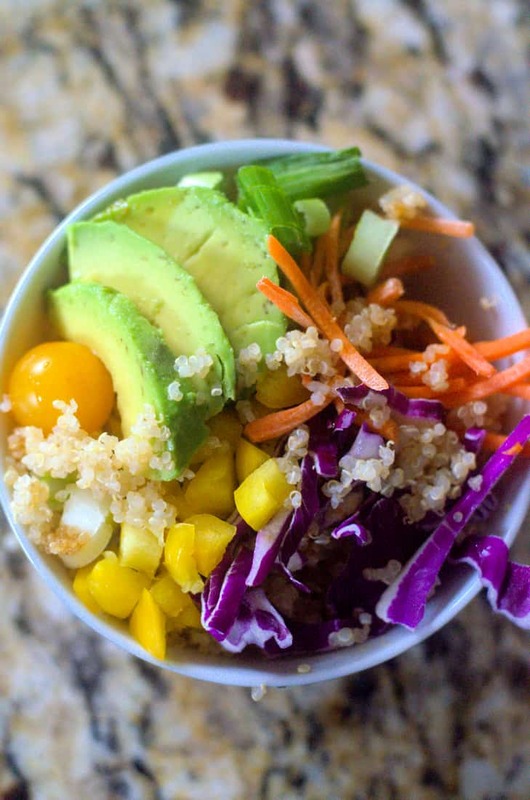 Vegan Quinoa Buddha Bowl: Simple meal that is super fast to make and leaves you full. Plus, they taste pretty great too! 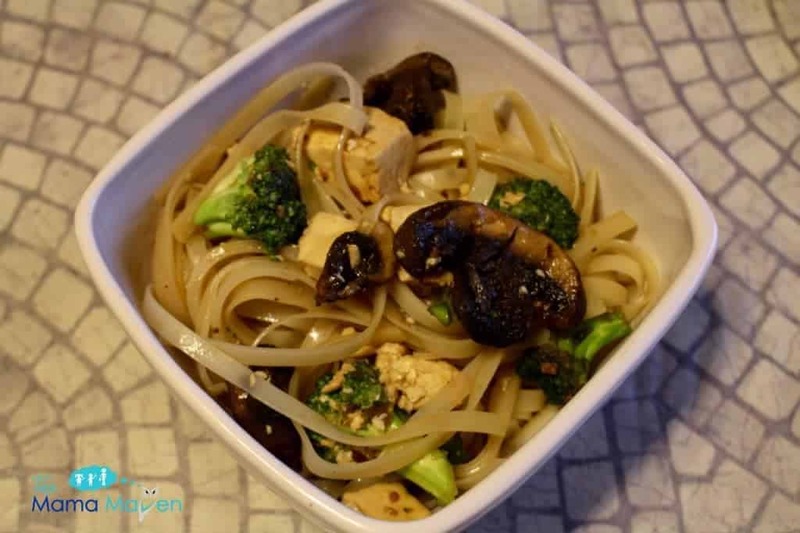 Vegan Tofu Teriyaki Stir Fry: All you need for this easy stir fry is tofu, broccoli, mushrooms, teriyaki sauce, rice noodles, garlic and olive oil. You can’t go wrong with this meal. 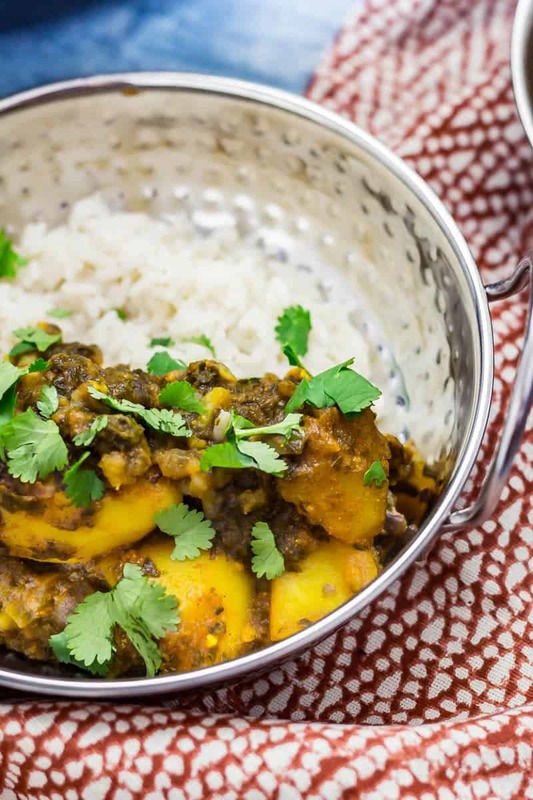 Easy Pressure Cooker Saag Aloo: Hearty meal that is super simple and keeps your appetite satisfied. This will become a family favorite! 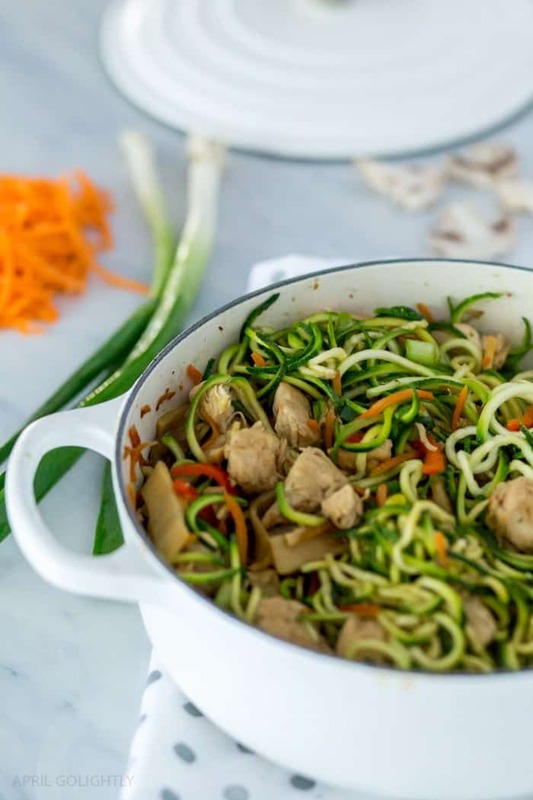 Vegan Lo Mein Recipe With Zucchini Noodle Pasta: Gorgeous meal that is fast and easy to make. Great for when you are in a hurry but still want a home cooked meal. 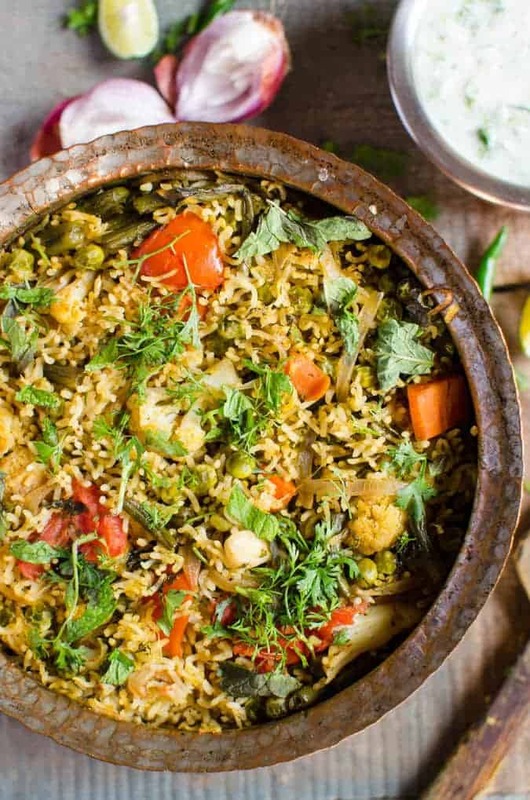 One Pot Vegetable Biryani: Satisfy your food desires with this fantastic one pot meal. You can’t go wrong with such a healthy and simple meal. Vegan Teriyaki Chick’n Strips Stir-Fry: These amazing strips of goodness do not actually have any chicken in them at all. Fresh pineapple takes this meal to the next level of tasty! 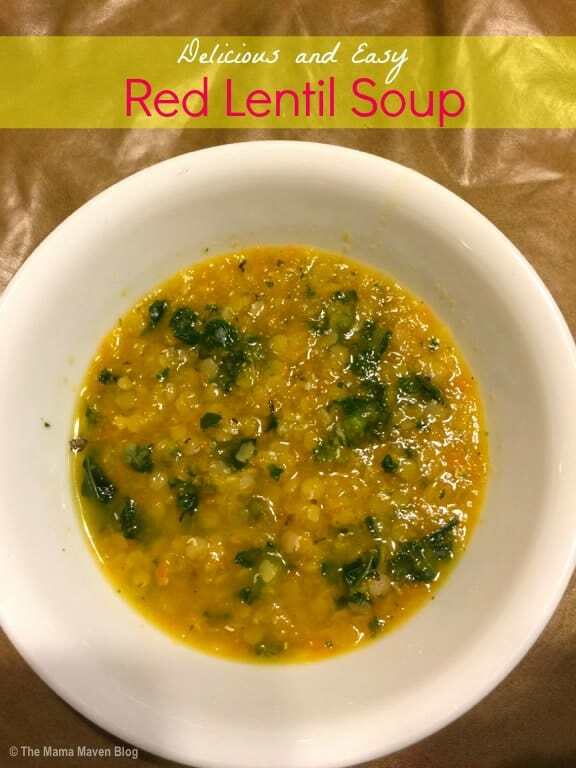 Delicious And Easy Red Lentil Soup: Not only does this soup taste fantastic, it is very versatile too. You can change ingredients based on what you have. Super yummy! 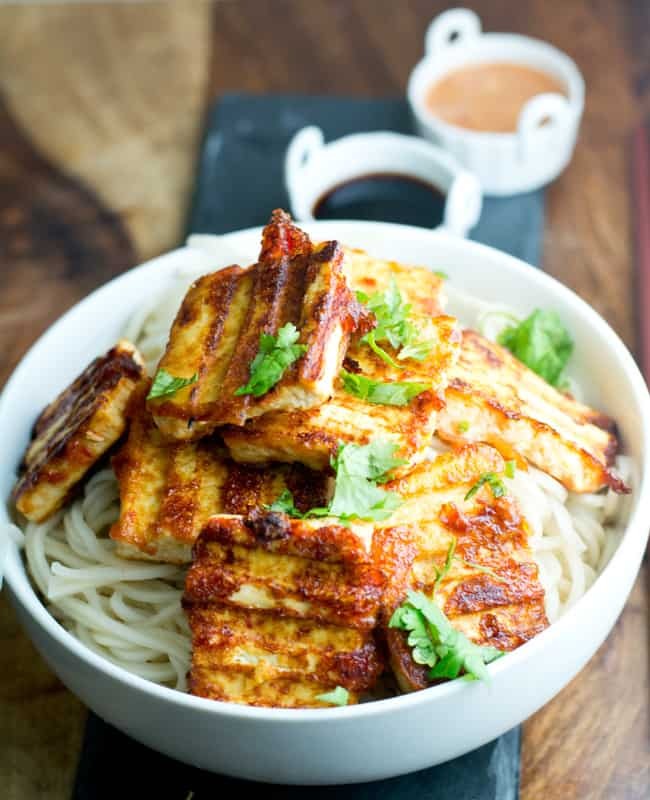 Tofu Steak: You only need 30 minutes and a few simple ingredients to make a meal that is going to satisfy the whole family. Better not plan on leftovers because it is going to get gobbled up! 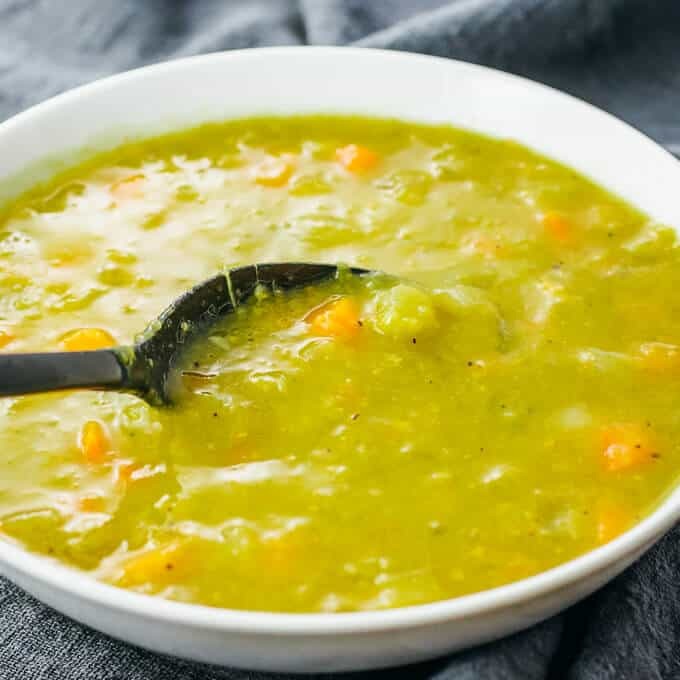 Instant Pot Split Pea Soup: Your family is going to beg for this soup. Serve with some warm fresh bread and a nice garden salad or enjoy by itself. Either way, you are going to love it. 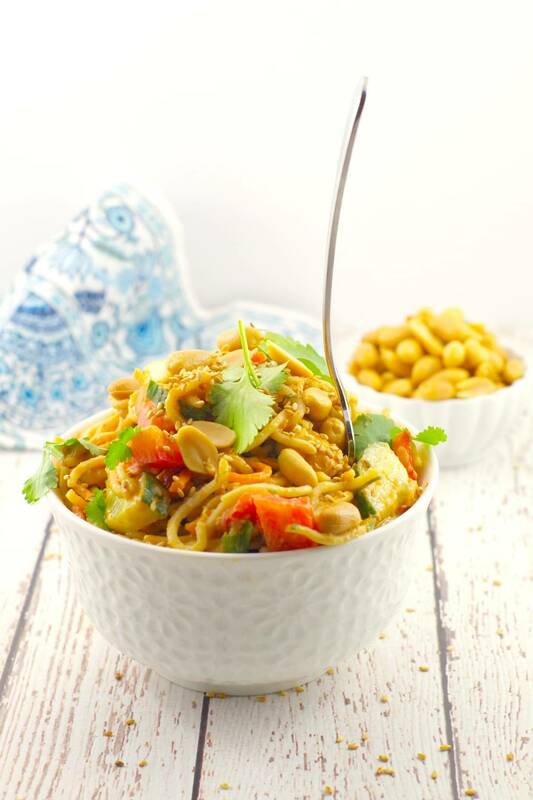 Easy Spicy Peanut Pasta Salad: Asian meal that is just the right amount of sweet and savory. You are going to want to lick the bowl clean it’s so delectable. 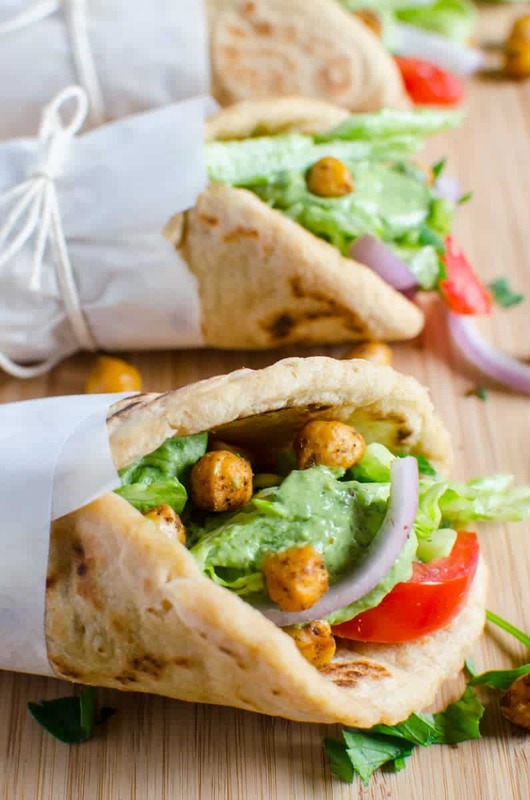 Lazy Falafel: If you only have about 30 minutes to make an amazing dish at home, you should try this one. It looks beautiful and tastes even better. 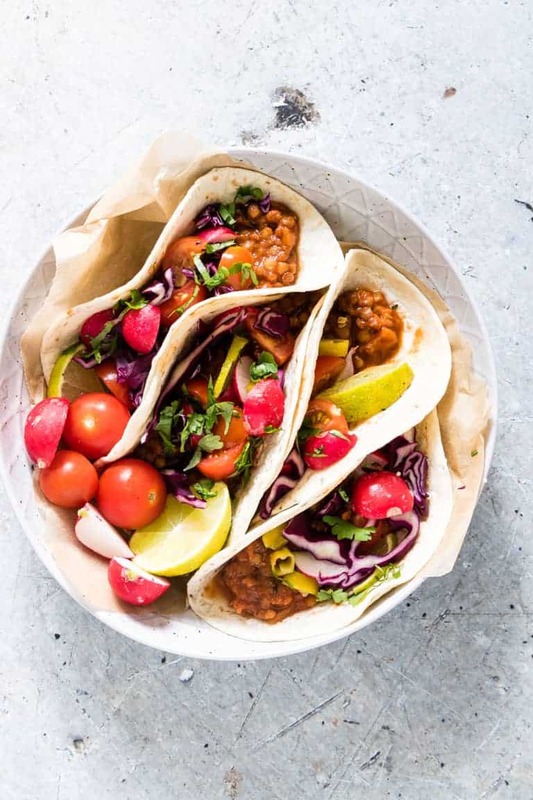 Mexican Vegan Tacos: Taco Tuesday will have new meaning once you take a bite of these tasty tacos. Perfectly seasoned and simply delicious. 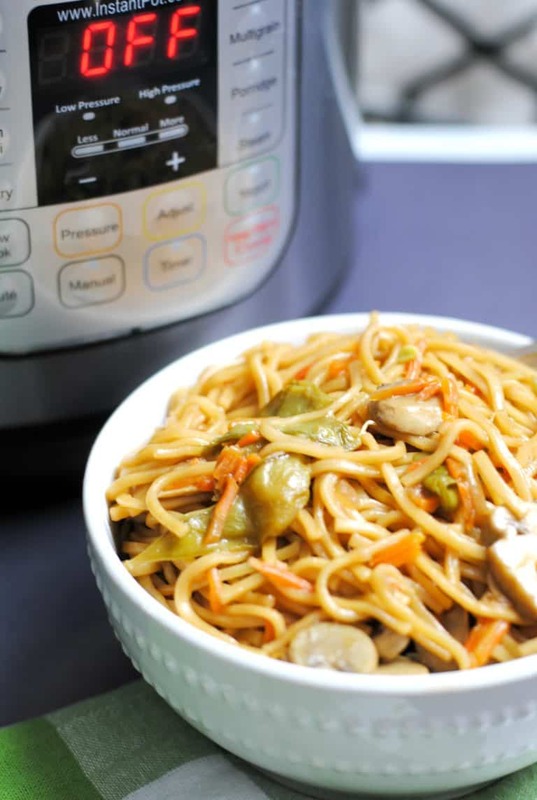 Instant Pot Lo Mein: Quick and simple one pot meal that is sure to please your family. The flavors blend perfectly to give you a dish that will keep you full. I hope you’ve found some delicious easy vegan recipes to try!! Be sure to let us know how your vegan dinners turn out as you get the chance to try them. We love to see them! 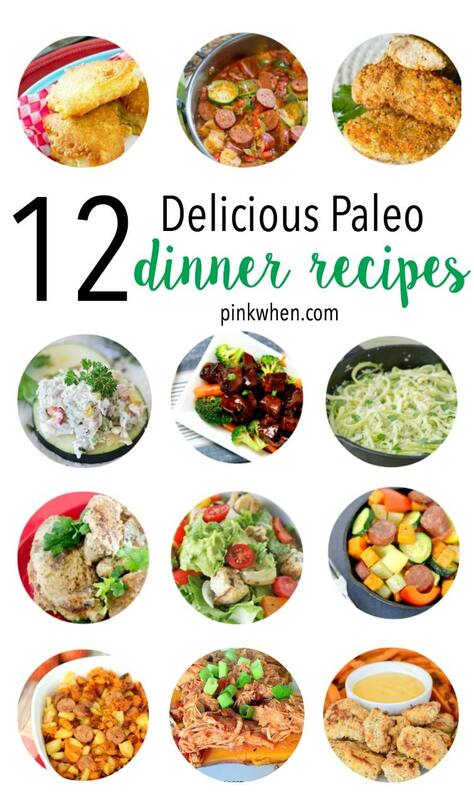 If you loved these vegan dinners, you’ll love these paleo dinner recipes! 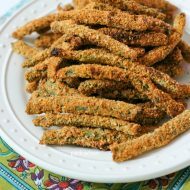 Or these yummy summer weight watchers recipes!